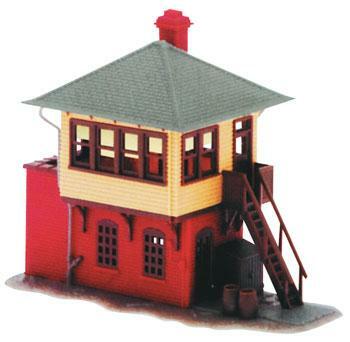 This is an N Scale Signal Tower from Atlas. Size of Base: 1.3" x 3"
"Great detail in a small package." Add a little paint to get rid of the plastic look and you have great looking kit. Don&apos;t forget the weathering. Fits into almost any rural or industrial layout. Plastic construction (molded in four colors--gray, tan, red, and dark brown). Parts are numbered (refer to instruction sheet for parts diagram). Includes clear plastice window "glass" with "shades" printed on them. Accurate reproduction with stairs, water barrels, and drain pipes. Please keep item safely out of reach of children under 3.